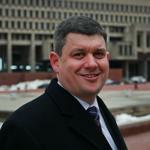 Boston City Councilor John Connolly announced today that he is running for mayor, challenging long-serving Mayor Thomas M. Menino to become Boston’s first new chief executive in a generation. Connolly said his campaign would focus on the need to bring change to the public schools and he would bring new ideas and new energy to the office. “I am running for mayor of Boston to transform our schools,’’ Connolly, 39, said at a rally at the corner of Warren and Cambridge streets in Brighton, outside Brighton High School. Connolly said the high school was at risk of losing its accreditation and said the city had failed both students and teachers there. “I want Boston to be the city they point to and say, ‘They did it’’’ when it comes to schools, he said. Connolly was flanked by about 40 supporters. After introducing himself as a city councilor and former teacher, he began with some words of praise for Menino. “Mayor Menino is a good man. His love for this city is unquestionable. I deeply respect Mayor Menino. I’ve worked with him, and I’ve learned from him. However, this campign is about Boston’s future and the need for new ideas, new energy, and a new resolve for Boston to reach its full potential,’’ he said. Connolly is the first significant candidate to jump into the race, abandoning his council seat, the Globe reported this morning. In stepping forward, Connolly risks taking the path of three previous councilors who dared to take on Menino and lost both the election and much of their political stature. Menino, 70, has not indicated publicly whether he will seek a sixth term. He must decide by May 13 whether he will file for nomination papers, the first step in launching another campaign. He has been dogged recently by a series of illnesses, which required a two-month hospital stay. For the last two months, he has continued his convalescence living at the Parkman House, a city-owned mansion with an elevator. The conventional wisdom amid much of Boston’s political establishment is that Menino will run again. But Connolly has decided not to wait. Growing up in Roslindale, Connolly hails from a prominent political family. His mother is chief justice for the state’s district courts, and his father was secretary of state for 16 years and served on the Boston Licensing Board.